We’ve been talking quite a lot recently about the equity market’s inability to hang on to gains in the last hour of trading. Heading into today, the index had traded down in the last hour of trading for six straight sessions. Today, equities were strong throughout the trading day and even started to leg higher just as we entered the final hour of trading. It looked like the streak of selling was easily coming to an end, but the bears didn’t go down without a fight. 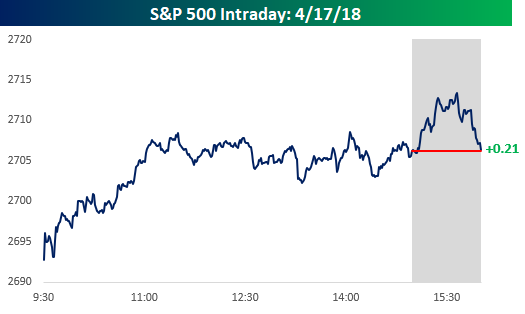 In the final half hour, equities started to give up some of their gains, and by the time the bell rang, the S&P 500 was up just barely in the last hour for a total gain of just 0.21 points! While today’s last hour gain ended the six-day streak of selling, the trend of last hour selling remains in place. For example, over the last 25 trading days, the S&P 500 has declined in the last hour of trading 18 times (72%), which is well above the historical average of 44% for all 25 trading day periods since 1983. In case you’re curious, the record for most last hour declines over a 25-trading day period was in the Summer of 2015, when the 25-day total hit 21 a handful of times between late June and early July. If you remember that period, the rest of the Summer wasn’t particularly enjoyable for bulls. Does A Reversion To The Mean Follow Big Up Years?